Jesus Christ is the source of true light in this time of darkness and shadow, says Bishop Dermot Farrell, in his first Christmas reflection since becoming head of the Diocese of Ossory earlier this year. “Christmas is a call to trust in the God who comes to us in this way. Our God is a God of trust – a God of trust is a God of risk. “God risks asking the young woman Mary in Nazareth; God entrusts his plan to her answer. Joseph too was willing to cooperate with the divine plan, though he in no way knew its contours or deepest purpose. Like Mary at the Annunciation, whom we admire for her response to God’s call and mission, he trusted and let himself be led. 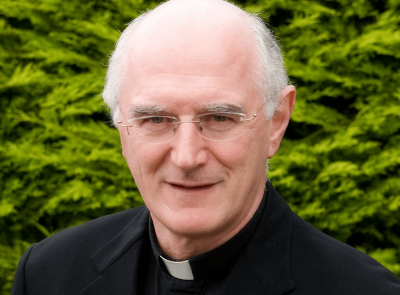 Bishop Farrell said today was a time of “darkness and shadow”. He noted Ireland’s homeless statistics, with 15 people in Ireland becoming homeless each day – many of them children. “Such a figure, however, does not convey the personal trauma that homelessness can bring. Today, it is surely not an impossible dream to hope that no person, particularly no child, in this country would be left homeless or go to bed hungry. I am thinking not only of those in hotel rooms, but also of our immigrants in detention centres and direct provision – every one of them precious to God. “Others have also experienced times of darkness and shadow: we think of those who live through war and famine, the migrants and the refugees. May the Lord open our eyes to see the image of God in every person, at every stage of their lives. “Emmanuel, you came to dwell among us as the source of true light. We see that light reflected in the lives of so many people. We see heroism and patience and understanding; we see honesty and unselfish service of others; we see genuine holiness and fidelity. “There are countless unnamed people in the world, in government, in the church, in our estates, in our townlands and in our families among whom God’s Word continues to become flesh and to dwell among us (John 1:14). Their lives testify that the reign of God has indeed taken hold. “O Lord, may my life radiate with your light and be perceived by all who sit in darkness. May all of us, by our love, bring light and hope to all whose lives are troubled this Christmas,” Bishop Farrell said.